Domestic Diva In Training: Feeling a bit put out. Feeling a bit put out. Today was apparently not my day. I really hurt myself tonight and I am hoping that it isn't a horrible injury and I won't be out of comission for too long. I was getting changed for Zumba tonight and as I bent over my right knee cap rolled off to the side and popped out of place. This caused my leg to bed a little bit backwards and a little bit sideways to try and compensate. I will admit I was not a big girl about it I fell down and started screaming for DH to come and rescue me. He came in and it took a while to communicate what was wrong through the pain. Once he understood he popped the knee cap back where it needed to be. Needless to say I did not go to Zumba tonight. 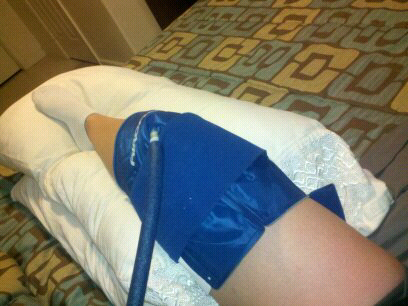 I have been set up in bed first with ice and now with one of the cool water circulation machines. It doesn't hurt too badly anymore but I haven't tried moving. So I am layed up for at least the rest of the night. I don't do layed up well. So I'm watching the History Channel and trying not to ask DH to go to the store for candy.